We can provide the latest audio visual,staging and sound and lighting equipment for Conferences , Award ceremonies , Presentations ,Product Launches and Gala Dinners at the most competitive prices with the best quality equipment and service. 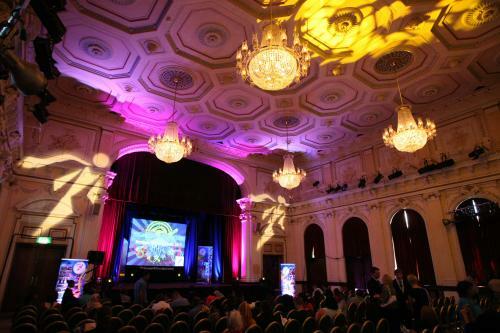 As a company we can deliver incredibly successful live events and audio visual services to corporate clients , public sector organisations and conference venues throughout Essex , the Sound East and London. If you are a venue who needs to outsource your Audio Visual , an Events team staging a conference or a novice planning a presentation , show or meeting we can help. We can offer complete stage sets with lighting to suit with Computer Aided Design realization of your event set with your ideas incorporated. So if you want to discuss planning a large event of simply need to hire a single item of Audio Visual equipment do not hesitate to contact us for friendly professional advice. We pride ourselves on the quality of equipment we can supply.